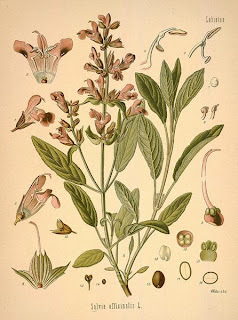 I get pretty bad hayfever at this time of year, and I'm not a big fan of too many over the counter medications (although I do take them if it gets too bad), but I have a cup of sage tea to relieve the itchy throat and it works wonders. Everyone should grow Sage... It's yummy shoved under the skin of a roast Chicken, or with Pork Chops too.